"Silverball Mania has a mirrored backglass with fantastic artwork by Kevin O'Conner." Silverball Mania is probably best known for its classic artwork, especially on the backglass. The mirror and black images give a unique visual effect that makes the backglass very collectable. The main feature on the playfield is a center loop-around which was also used on the popular Space Invaders machine. This machine also features a center drain kickback that has wireforms leading to it from the side drains which you can try to maneuver the ball into. See pictures for details as it is difficult to describe. This was a simple problem. One of the connectors on the display was not seated correctly. I swapped the player two display with the player one display to see if the problem was with the display itself or somewhere else. After swapping the displays, everything worked fine, suggesting that the problem was simply a bad connection. Problem #2: After playing for 15-45 minutes the flippers would go dead while everything else still worked. First, I checked all of the connectors mentioned, and they checked out OK. Second, I checked the wiring under the playfield and it was OK. Third, I pulled the MPU and swapped U10 and U11. The socket for U11 was very dirty. I cleaned it with alcohol before re-inserting the chips. This corrected the problem. Thus, a dirty chip socket was causing a poor connection for U11. This was a difficult problem to figure out. Thanks to Ray Johnson for the tips. The first question was, "Should I Remove the Mylar?" Here was the dilemma. 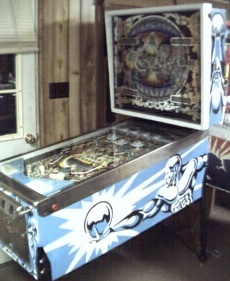 The playfield was covered with Mylar and was in great shape under the Mylar. However, there were some trouble spots. The Mylar below the center loop-around had been pieced together and/or patched up in spots. One of the "patch" pieces had come off exposing the bare playfield. 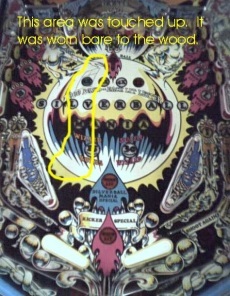 The playfield was worn bare down to the wood in that area. So, I had to decide if I wanted to remove the mylar. On the one hand, since most of the playfield was in great shape and covered by Mylar I could leave it and touch up the area but it would leave an uneven area right in the center. Or, I could remove the Mylar and touch up the area and there wouldn't be the uneven spot. Here's a view of the playfield touchup.